Show everyone the house rules in style. 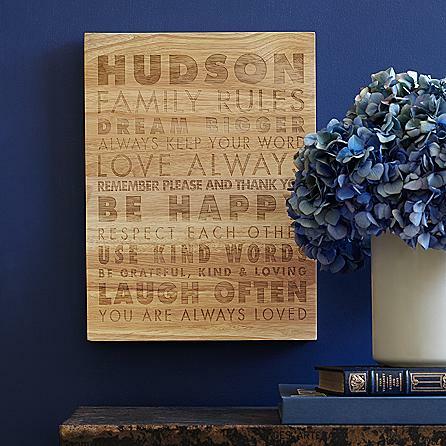 Showcase your house rules in an inspiring piece of wooden wall art offered exclusively from RedEnvelope. This unique creation is created specifically for your family or other loved one as you personalize it with the name of your choice. Add some whimsy into your family management this holiday season and share tidbits of wisdom for running a prosperous household. 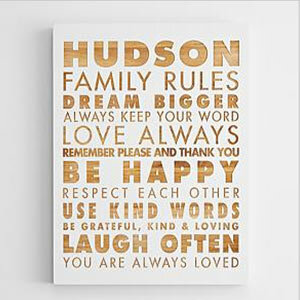 This custom art piece makes a perfect gift for loved ones, or add it to your own decor for an inspiring reminder that your family can reach success and happiness through respect and dedication to each other. Available in 3 sizes , 12 in. x 16 in., 16 in. x 16 in., and 18 in. x 24 in. Personalize with any family name, up to 12 characters, uppercase letters only. The complimentary red gift box is not available for this item. Order your personalized family ruled wooden wall art today!